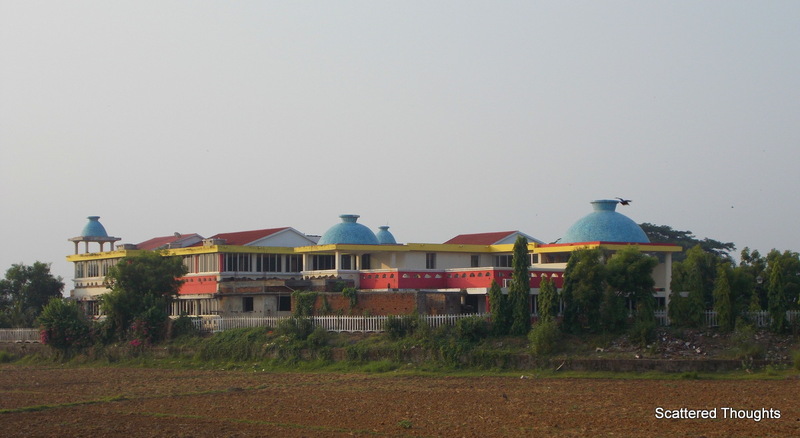 Recently I had a chance to stay at the Toshali Resorts in Ratnagiri, Odisha. Toshali Resorts, a chain of exquisite resorts in different cities of India, is owned by TK International Ltd. 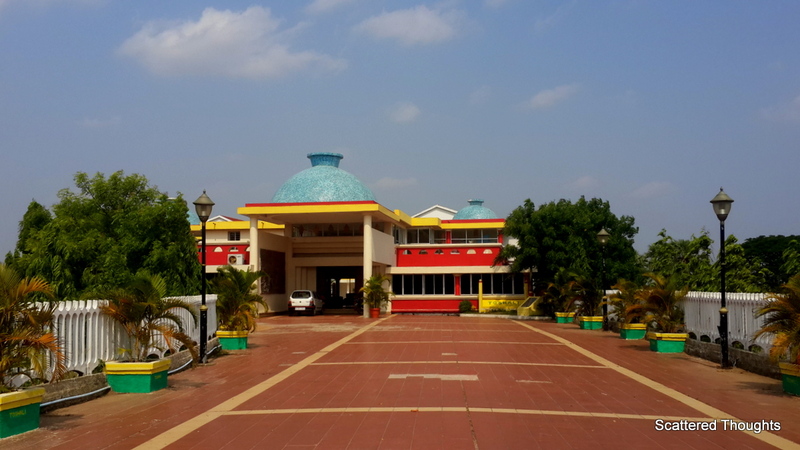 They ventured into the business with their first resort in Puri, Toshali Sands, with 109 rooms. I have had my experience of staying at Toshali Sands, Puri and, so, was really excited to spend a couple of days at their Ratnagiri resort. It was a hot, humid, afternoon and though the distance from the Katak railway station was only 70 km, excruciating heat and dust made us quite exhausted. We received a warm welcome at the reception and, as I was engaged with the usual formalities, a bellboy served us cold drinks. I didn’t have xerox copies of my credentials with me but was assured that will be taken care of. Within five minutes, the formalities were over and, we were ushered to the room allotted for us. As soon as we entered the room, rejuvenating fragrance of room freshener welcomed us. The room was quite spacious and comfortable. The interior looked elegant and sophisticated. 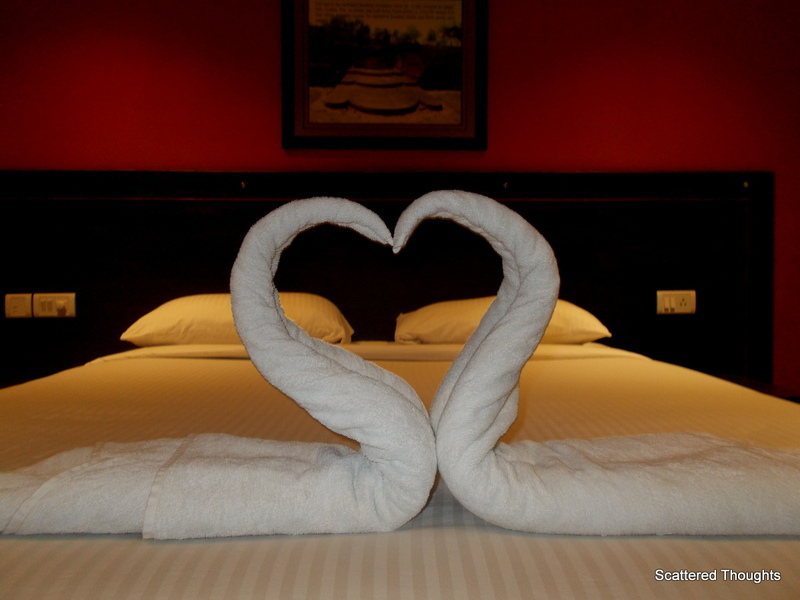 I especially loved the way they made the bed (though we were not a honeymoon couple, still I liked the simple art). The air-conditioner was working perfectly and within a few minutes we felt relaxed. Ratnagiri, Udaygiri and Lalitgiri are together called the Diamond Triangle of Odisha, you can read about the places in details here. Anyway, the history is not germane to this discussion, what amazed me was the way the interior of the resort was designed in perfect sync with the historical aspect of the place. 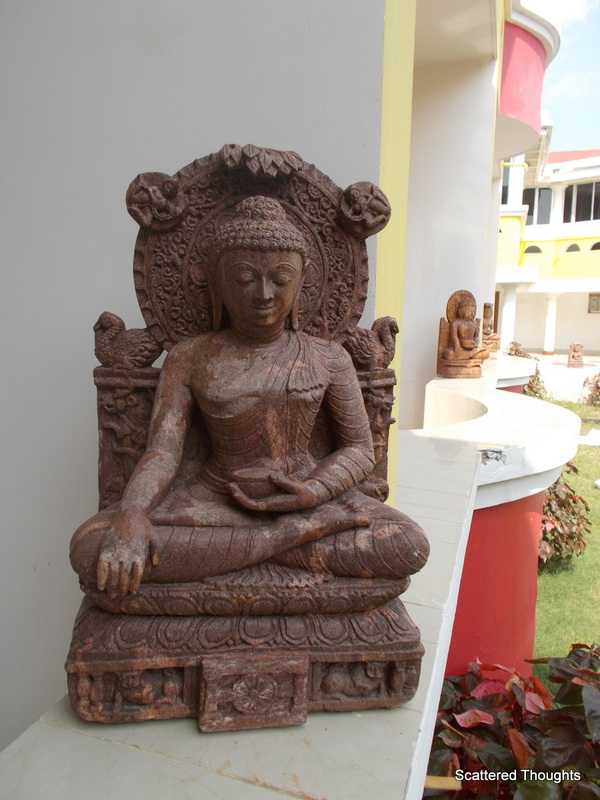 Statues of Lord Buddha placed at strategical points, murals and paintings, have given an ethnic feel to the whole ambience. Peace prevailed over the place. Food is another reason why I love the place. Delectable dishes, be it Chinese or Indian (we ordered typical Bengali dishes one day and were more than satisfied with the toothsome taste) would make you crave for more. Wall Decoration At The Reception. The only problem being there was no intercom in the room making it quite inconvenient at times to place orders for snacks, cold drinks and other needs. 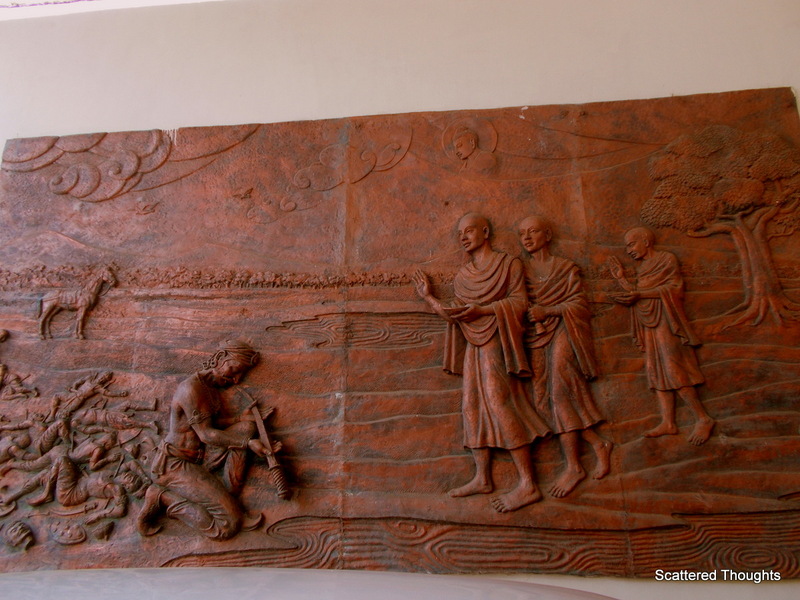 Overall, I had a nice experience staying at the Toshali Resorts, Ratnagiri. As the tagline of their website reads, “Toshali Resorts: Where nature comes alive”, you will be able to feel the presence of blissful Nature caressing you. nice and informative post Mani .. specially in less words ! A nice comfy hotel makes the trip seems stress free … You are right about the intercom feature – its a must , specially with kids . Glad you had a wonderful time, Mani – the peaceful ambiance of the hotel is inviting me in! This place surely looks great. That seems to be a good one. Great interiors and exteriors! As and when I do visit, shall definitely remember to stay here! Maniparna, that’s a compelling review and love art craft made from simple stuffs. It deserves a visit, I think, despite the minuses. I have never visited this part of India probably never heard of any places worth visiting. Your review is inspiring enough to plan a visit to Odisha. There are so many wonderful places in Eastern and North-eastern part of our country…Arunachal Pradesh, Nagaland Manipur…. these states are breathtakingly beautiful. But, tourism is not so developed there, for different political and social reasons. I agree with you Mani, North-eastern part of India is awe-inspiring…from Sikkim to Shillong, I have seen that untouched beauty of Mother Nature, it has been a unique experience, which I cherish. 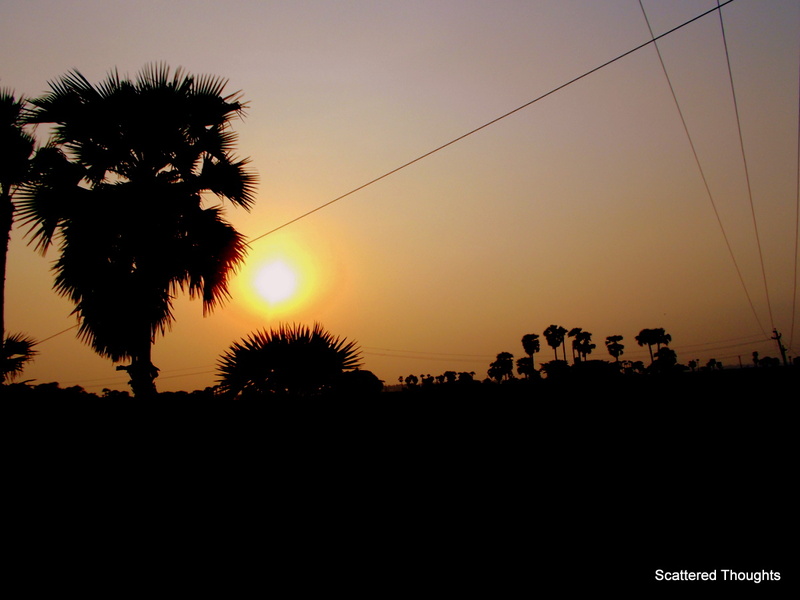 Don’t know why…Odisha has never captured my attention! Someone I have missed visiting this resort though have gone to the resort in Puri, and have had lovely experience. You keep reminding me that I should start visiting these places so close to my hometown and have not yet explored, it is same story for me, of so near but so far not visited. I agree it is humid and very difficult travel through the road and reach the destination, the heat zaps away the energy. Once inside such resort, it gives the cool break and also food generally are very delicious. Next on agenda to explore this golden triangle. Yes, those beautiful sunset and natural beauty keeps you hooked. Things must been decked after the Rath Yatra, and you may see many new things..
That’s no nice of you Maniparna, me too not visited, has been little long. It is nostalgic and yes the urge is strong, Haiku and Mogli keep reminded me and outside the zoo it is Kuki which keeps telling me to go and talk the Bani Uncle. Looks like a comfortable place to stay. Food is really important to me, and as you said food is great, it’s a winner. I can suggest their Puri hotel to my parents who are going there. For their Puri Resort, let me tell you , it’s outside the main town, away from the hustle and bustle…amidst the nature but away from the sea. They have their own beach which is away from the resort itself. They provide conveyance to reach there. Hey nice review of the resort Maniparna. The towel art it seems is catching on. Reminds me of the towel art at the Coorg resort. Btw Odisha and Maharashtra have some similarilty in terms of dishes and even surnames (Nayak and Naik). Ratnagiri is in Maharashtra also. Well that swan was a piece of art. Good review Maniparna, honest and outspoken! I love that swan love towels 🙂 very creative! Are they on the spicier side? Shruti, let’s rephrase that sentence a bit. Anoop, that is not so. I am yet to try a lot of dishes 😀. Hopefully one day I will accomplish my mission! 😊 Maniparna, will be dropping by your place soon, maybe will drag this Anoop along. He he! I’ll happily come along 😀 😀 Free food, yaay!